The Paris Centre for Cosmological Physics is a place of research, education and scientific exchanges in the field of cosmology, or more generally the physics of the Universe. It was created in February 2010 by George F. Smoot, when he was hired as professor of the University Paris-Diderot and he saw the opportunity to create a large Parisian centre dedicated to cosmology. 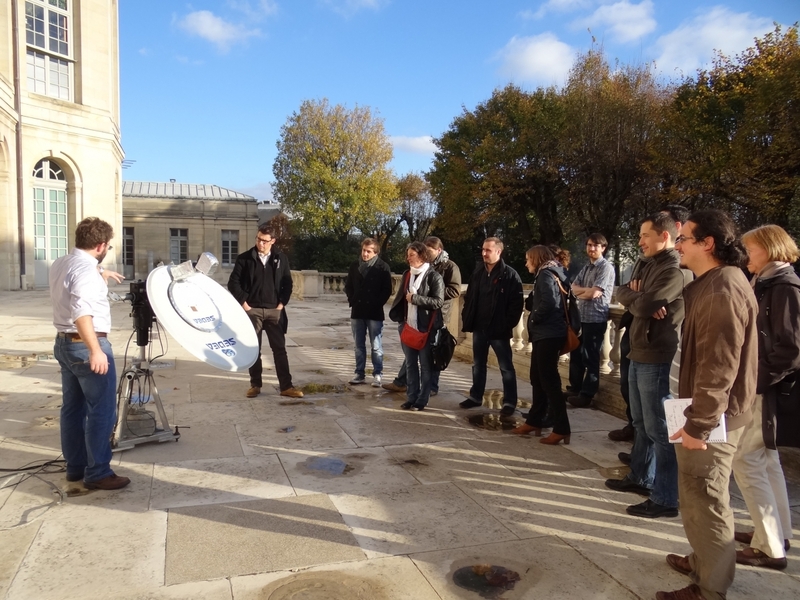 Supported from the start by University Paris Diderot, CNRS/IN2P3 and the Paris Observatory, PCCP aims at developing a synergy between the Parisian laboratories (at present APC, LPNHE, LUTh, GEPI, LPTENS) to enhance the contribution of the French community to the rapidly developing field of cosmology. LabEx UnivEarthS contributes to the financing of some of the actions of PCCP such as the organization of workshops, visitors and postdoctoral programs, but also the training of high school teachers and the conception of a general public MOOC to share a scientific adventure on the frontiers of the knowledge. a valorization program together with GEPI, on Microwave Kinetic Inductance detectors, also under the leadership of Pierre Binetruy. We will report the results of this program separately. The death of Pierre Binetruy on April 1st 2017 had of course a decisive impact on the activities of this workpackage. S. Katsanevas director of APC, with the help of Marie Verleure, took over some of the tasks, but these were added on his already very heavy agenda, so delays were unavoidable. Matteo Barsuglia was appointed as PCCP director at end of July 2018, and he is in the process to restart the various activities of the center. just a translation but a whole new course adapted to the British platform Futurelearn, significantly different in spirit from the French platform. It is considered among the most successful MOCC’s worldwide, since it currently counts close to 100.000 inscriptions. Two highlights of the course were a hangout on Nove ber 18 2015 to celebrate the 100th anniversary of General Relativity with a cast of distinguished scientists (Roger Blandford, Karsten Danzmann, Gaby Gonzalez, Thomas Hertog and George Smoot), and a hangout live from Kourou with the chief of operations, and the whole LISAPathfinder technical team, a few hours before the successful launch. The course was also launched in London with a 3-day exhibit of the Kinetica Museum entitled Gravity! This was the first exploration of the art and science connection (see below). In order to streamline this effort, it was created, with the support of the Labex communication (C. Epitalon), a dedicated website gravity.paris, where learners can find information of the gravitational Universe and the latest news. And news there were since a month later, on February 11 2016, the discovery of gravitational waves was announced. We took this opportunity to invite our (at the time) 70 000 learners to Paris for a Gravitational Wave Fiesta. 30/01/2017 to 12/03/2017. Attending results were even better than the two previous sessions. According to the different levels of involvement there were 7912 Joiners, 4031 (51%) Learners, 1195 (29,6%) Social learners (present on the forum) and 1089 (27%) finished the whole course. Special relations with a private High School (International School Jeannine—Manuel in Paris ) have been developed in the context of the MOOC. P/ Binetruy visited their classes and answered questions. In the future M. Barsuglia is continuing this activity. They were shown the labs, followed lectures and the Nobel announcement and participated in a questions and answers session. The program “Teaching the Universe” is continuing as well. There was a new session on November 16-18 2016. A session of “Teaching the Universe” was performed in Athens. • Valerie Domcke was awarded on October 12 2016 one of the L’Oreal-UNESCO fellowships for Women and Science. She was also offered a 5-year position from the Theory Group of the DESY laboratory in Hamburg (an excellent position, especially for a young candidate), which she accepted. She ended her contract on September 2017. 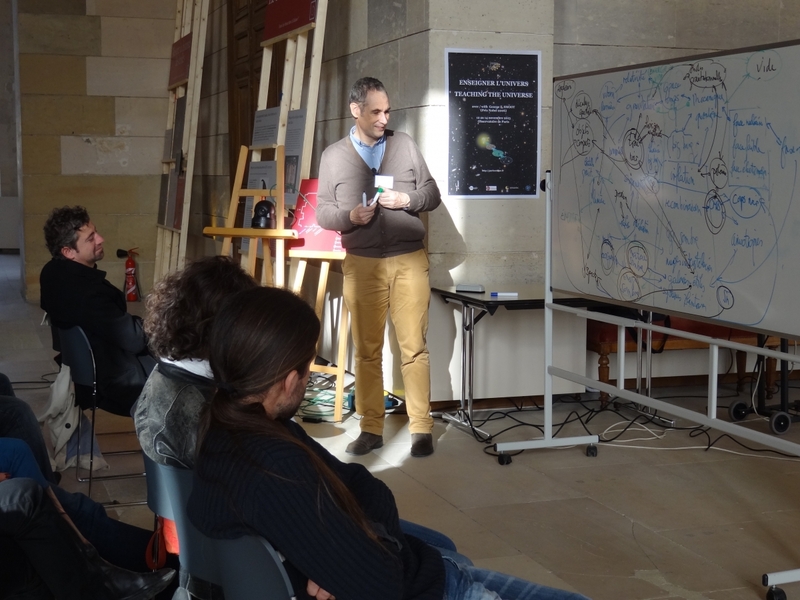 • Matteo Barsuglia is starting an activity about Cosmology and gravitational-wave in collaboration with the Virgo group and the theory group at APC. Univers 2.0 PCCP, and in particular P. Binetruy, has obtained funding from the Foundation Carasso (40 K€) to initiate an exploration, through a cross-reflection between artists and scientists, of the field that opened through the discovery of gravitational waves putting again at the centre questions on the nature of the space and time, their texture, the notions of origin and horizon, the role of information circulating in the Universe and its conservation or loss, the role of the human as observer and/or perturbator, more generally the nature of our embedding in the cosmos. This reflection will be initially carried out within the multidisciplinary team set up including very well known artists internationally (Gorka Alda, Bertrand Lamarche, Liliane Lijn, Thomas Saraceno, Raymond Galle, Raphael Dallaporta). Philosophers also participate in the discussion (Heinz Wismann, Céline Flécheux). The work program includes for the time being artists residencies, workshops. On the scientist side, there were essentially some of the PCCP scientists and Marc Lachièze Ray. The project will culminate in two year’s time with a restitution seminar, accompanied by an exhibition and a publication. In the context of this program, several meetings between art and scientists were already organized. This reflection will be initially carried out within the multidisciplinary team set up including very well-known artists internationally (Gorka Alda, Bertrand Lamarche, Liliane Lijn, Thomas Saraceno, Raymond Galle, Raphael Dallaporta). Philosophers also participate in the discussion (Heinz Wismann, Céline Flécheux). The work program includes for the time being artists residencies, workshops. On the scientist side, there were essentially some of the PCCP scientists and Marc Lachièze Ray. The project will culminate in two years with a restitution seminar, accompanied by an exhibition and a publication. Dhiraj Kumar Hazra (APC, Paris), Arman Shafieloo (KAIST, Taejon), George F. Smoot (APC, Paris & Paris U., IV & Hong Kong U. Sci. Tech. & UC, Berkeley & LBNL, Berkeley), Alexei A. Starobinsky (Kazan State U. & Landau Inst.). May 6, 2016. 22 pp.